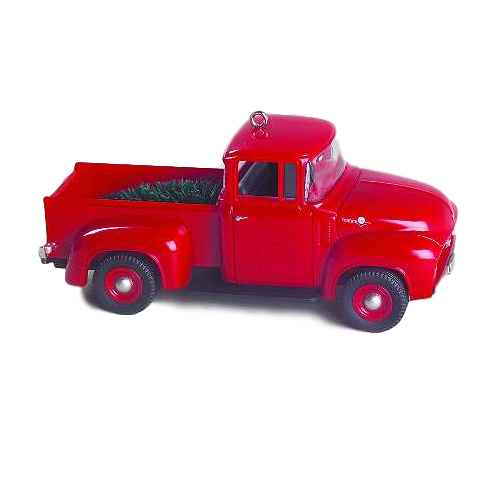 First in the Hallmark Keepsake Ornament series - All American Trucks - is the 1956 Ford Truck. This handcrafted Hallmark Keepsake ornament features wheels that turn. The front license plate is dated "1956"
The back plate on the Hallmark ornament is date "1995"
This,like most all Hallmark ornaments,is well made. I like the license plates, that say when the truck was made,and the year it came out, as an ornament. Item was as advertised. I have been collecting the Truck Series and Classic Car Series from nearly the introduction of each series. Price was great and condition was as if I had just purchased new from Hallmark.